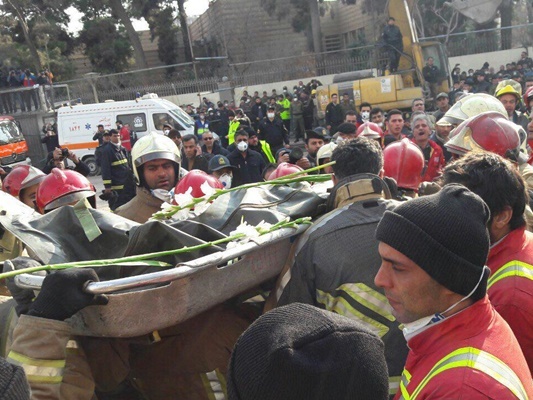 A funeral ceremony that was due to be held on Thursday for the firefighters who lost their lives in the tragic collapse of a high-rise building in Tehran has been delayed for a couple of days, an Iranian official announced. Deputy Mayor of Tehran Mojtaba Abdollahi said the funeral service, initially slated for Thursday, has been postponed following a request from families of the victims. Seven more bodies were recovered from the rubble on Wednesday. Therefore, he noted, it was decided that the funeral procession be held for all victims of the tragic incident later. The collapse of the Plasco building in Tehran killed more than 20 people, including 16 firefighters. The building caught fire on January 19 morning and came down after four hours, blockading a number of people under the debris, Tasnim reported. Some 200 firefighters had been deployed to the site to put out the fire. The building, one of the capital’s oldest high-rises, was housing 600 production workshops, 400 of which were being used for making shirts. Material damage from the collapse is estimated to stand at around 15,000 billion rials ($463 million).